My son’s a sweet person… it must be in his DNA. Our yellow lab puppy digs holes… it must be in her DNA. 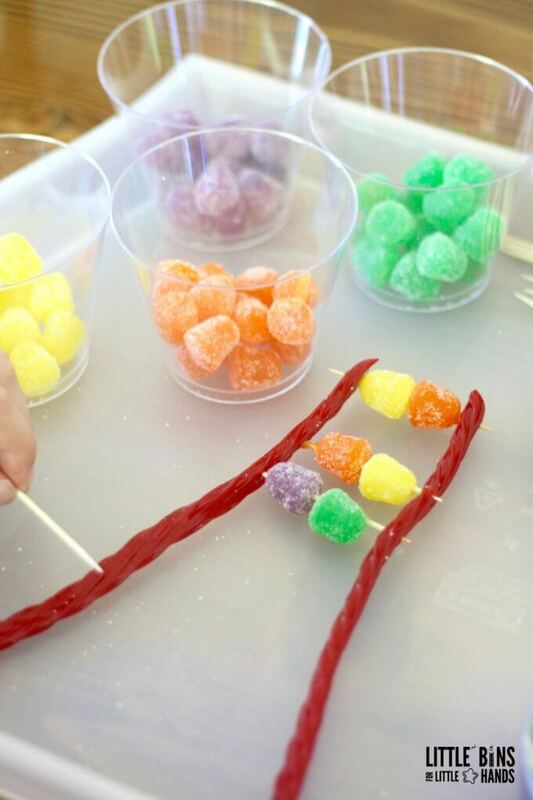 After building our candy DNA model for our edible science series and having a simple conversation about DNA, my son’s little DNA jokes didn’t quit. 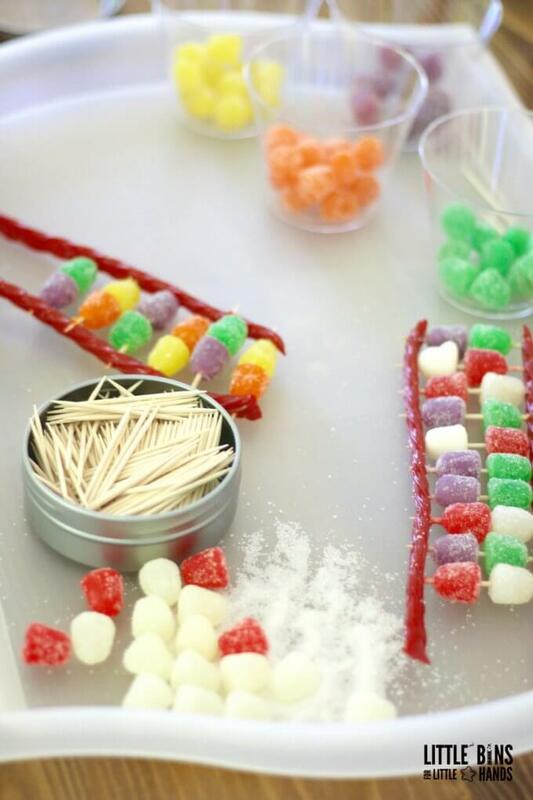 DNA is fascinating and making it out of candy is just as fascinating according to my kid. 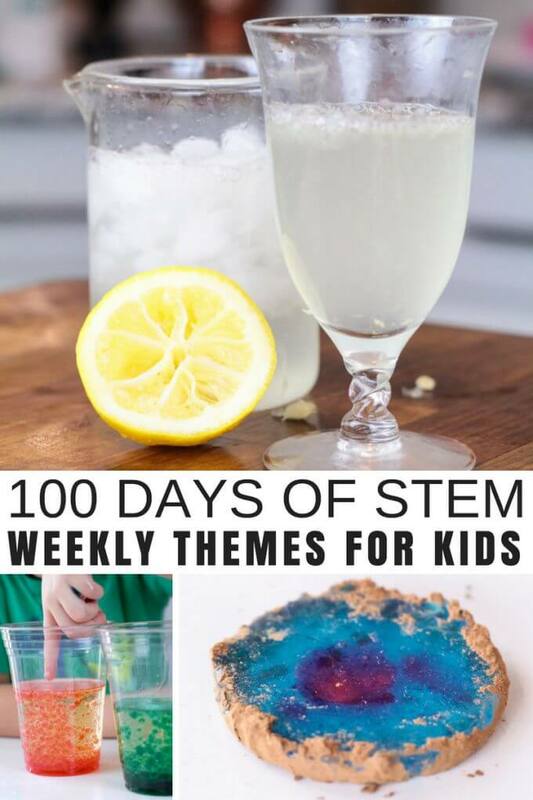 Science you can eat too! I’m not talking just about science using food (we have that too), but I’m talking about science you can nibble on. There’s no better way into my son’s heart or brain than with food. Of course it doesn’t hurt that he’s growing like a weed. 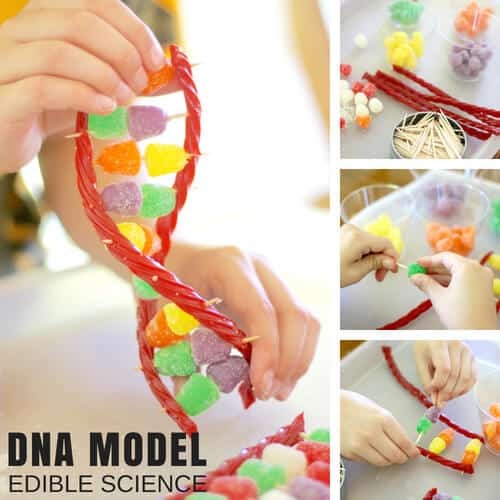 Building a candy DNA model with my 8 year old son allowed us to explore and talk about some basic biology of living organisms such as ourselves while we used our hands to build with. We talked about what makes us unique and how that happens because of our DNA. 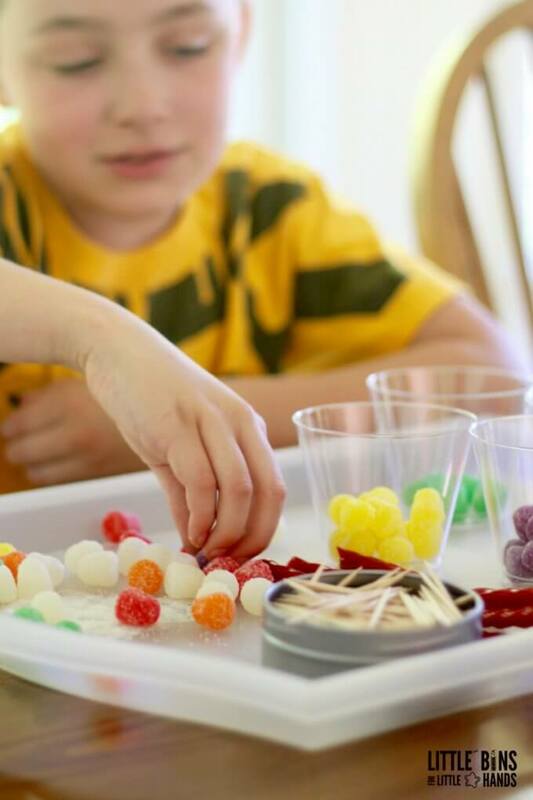 Start your candy DNA model by sorting the 4 colors of candy into separate bowls. Then you want to assign each one to a specific nucleotide. These 4 nucleotides along with the sugars and phosphates make up your double helix candy DNA model. Adenine and Thymine are always paired together. Cytosine and Guanine are always paired together. 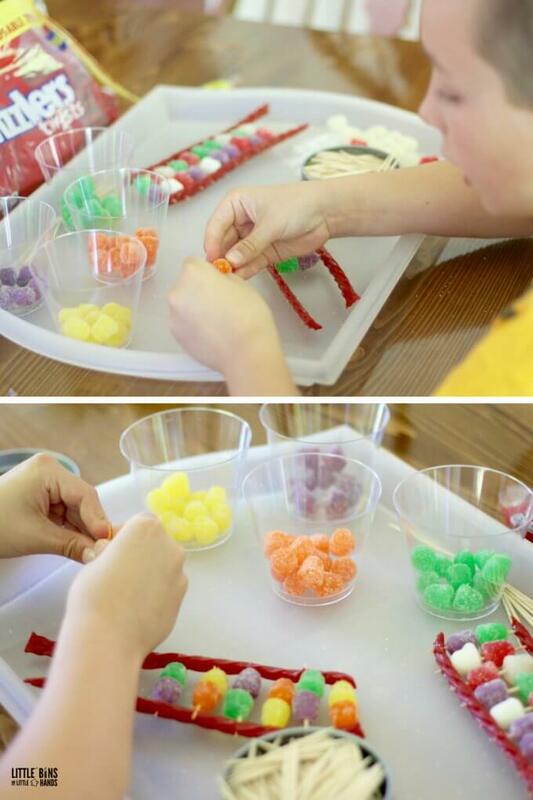 Now it’s time to start making up pairs and building your candy DNA model. Our DNA can not be seen with they eyes only high powered microscopes, but DNA is long thin molecules. You can extract DNA from strawberries for a neat up close look at strawberry DNA. 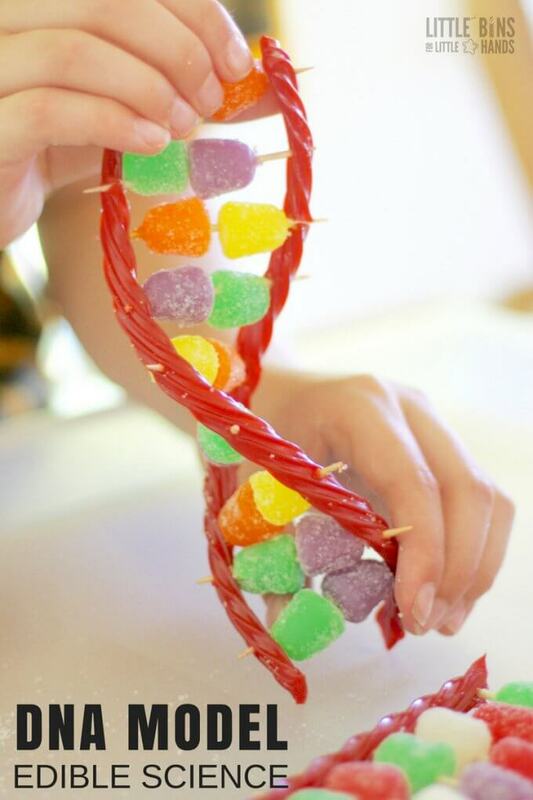 We each made our own unique strand of candy DNA and twisted them into what is known as a double helix. 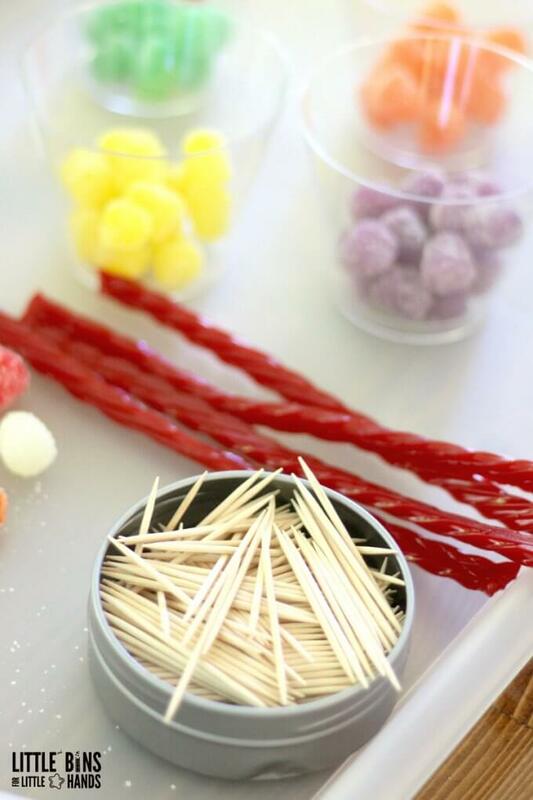 The back bone (Twizzlers) of your candy DNA model is what gives the double helix it’s specific shape. They also hold together the A, T, C, G nucleotides. There are endless combinations that can be made, but the pairs of nucleotides must stick together. Our bodies are made up of cells. These cells contain hugely important molecules called DNA within the nucleus of the cell. DNA essentially tells the cells what to do. This is a roadmap to how our bodies operate. DNA sends information to our cells for proper function. DNA is also what makes us unique to one another. Each string of DNA carries a set of instructions called genes. The gene tells the cell how to make a specific protein. Proteins are used by the cell to perform certain functions, to grow, and to survive. These genes are also passed down to offspring. 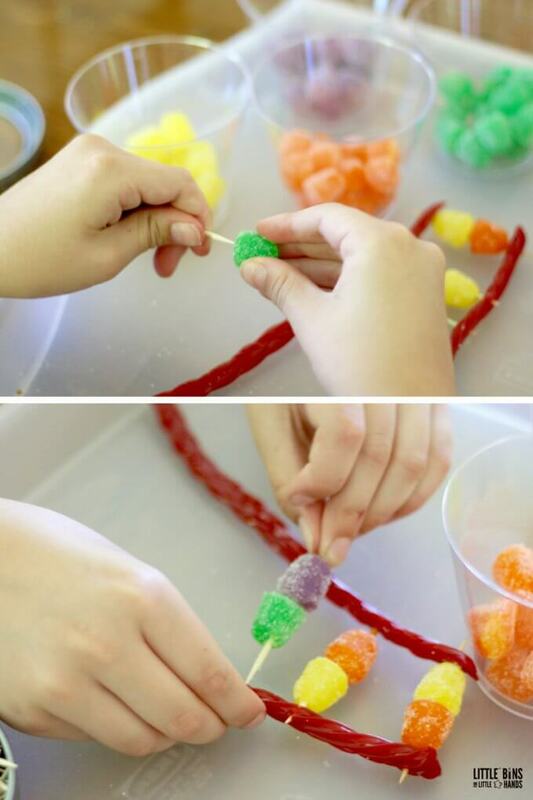 If you have some extra candy laying around or want to pick up a few bags for a group biology project, building a candy DNA model with the kids is a great way to keep busy. test gum drop solubility with different liquids (use gum drops in place of candy hearts).